The skin is the largest organ of the body and is your best defense against pathogens that can make you sick. If you've ever had an open skin injury, you probably noticed a scar after healing. Scars are part of the body's healing process and how visible scars are depends on a few different factors; nature of the injury, healing time, age and race. Having high levels of melanin in the skin will make a scar worse. Scars can be unsightly, embarrassing and even painful. Many people are turning to alternative remedies for scar removal. There are many healthy alternatives for treating scars that are safe, effective and low in cost. How do Scars Form on the Skin? Scars are the deposit of a fibrous tissue called collagen, much like the original skin tissue, but is laid down in a different pattern. Healing begins by the blood clotting in the wound bed. The body then begins depositing collagen to repair the broken skin. This "new" collagen is not the same as the original tissue; therefore it has a different appearance than the original skin. 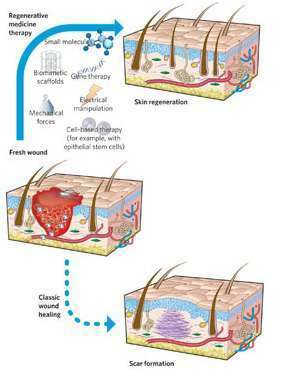 The longer it takes a wound to heal, the more collagen is deposited in the wound and the worse the scar is. Scar tissue is usually pink or red and does not contain any sweat glands or hair follicles. 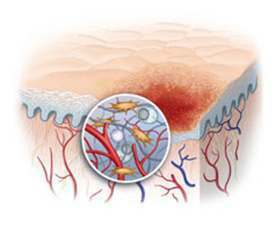 Some types of scars can contain blood vessels and nerves, but most do not. Skin regenerates itself all the time, but once a scar has formed there is no more cell regeneration at that site. Over time, the discoloration may fade, but the scar never completely goes away. There are four types of scars: keloid, hypertrophic, atrophic and stretch marks. A keloid scar is an overgrowth of the granulation tissue that heals the wound, which causes a firm nodule at the site of the injury. Keloid scars can be itchy or painful and unsightly. Keloid scarring can occur in anyone, but are less likely in young children under 11 years of age. Very similar to keloids, hypertrophic scars are raised and red-pigmented scars, however, they to not protrude beyond the site of original injury. Often painful and itchy, these scars may form at the site of body piercings, pimples, cuts, or burns. These occur when muscle and fat are lost due to the injury and the scar appears sunken. Severe acne issues can cause atrophic scarring to the face and removing a cyst or tumor from the body can leave a depression in the skin. This happens when the skin is overstretched such as during pregnancy, during times of being overweight or in body builders. These scars are caused by actual tearing of the dermal tissue; they cause the skin to change composition and color in the area. This procedure involves using a strong acid on the skin to cause regeneration of new skin tissue. It is not very effective and averages about $150.00 a session. Involves injecting filler under the skin into the old wound site. 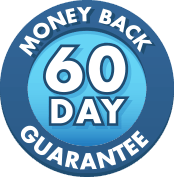 The effectiveness is unpredictable and can cost anywhere from $350.00 to $5,000.00. The skin is rubbed with an abrasive substance or a sandpaper like pad. It requires numerous treatments and the cost is around $100 a treatment. A strong light beam is used in combination with a vapor to smooth the surface of the scar tissue. Laser treatments only work on certain scars and certain skin conditions are not eligible for laser treatments. Costs can average up to $900 per session and the average amount of sessions is four to significantly reduce scars. When the body is healing, the adrenal glands produce steroids to help the body through the period of stress. Synthetic creams, injections or oral tablets can be used and are longer acting than the body's natural steroids. Adding steroids can be dangerous, as it suppresses the body's own response and can "shut down" the adrenal glands. This method is relatively inexpensive, but has major side effects. This method uses a silicon gel sheet placed over the wound bed. It works by moistening the wound bed to increase hydration of the stratum corneum, which is the very top layer of the skin. 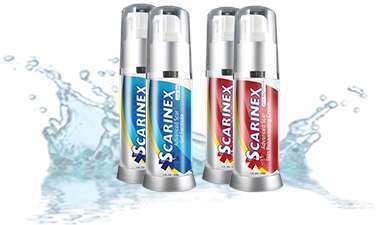 The hydration softens the new tissue and reduces scarring. Studies have shown this method to be ineffective. The cost of the occlusive dressings start at $30 per sheet and must be changed two to three times weekly. Low doses of radiation are used to break down scar tissue. There has been a lack of clinical trials to prove its effectiveness and long term effects of radiation exposure can be detrimental to the body. Also, radiotherapy is usually done in the hospital which is very costly. Never use alcohol or peroxide on a wound. They are caustic to the granulating tissue and will slow healing and worsen scarring. Wash the wound daily with normal saline or sea salt solution. This is anti-bacterial and a natural astringent. Pat dry and do not rub the wound bed. This will disturb the granulation of the tissue. As long as the wound bed is moist, keep it covered. When it starts to dry out, uncover it but try to keep it out of the sunlight. Do not pick at the scab when it forms. This will delay healing because the body has to lay down more collagen and worsen scar tissue. Allow the scab to fall off naturally. Saline washes will assist with speeding up this process. Since collagen is a form of protein, it is helpful to supply the wound with adequate amounts of protein. It is helpful to increase your lean meats such as; chicken, turkey and fish. In addition, wounds need Vitamin C, Vitamin E, Selenium and Zinc. Taking a good multivitamin every day can decrease healing time and scar formation. With good wound care at the time of the skin injury and natural scar removal treatments you can safely reduce the appearance of unsightly scars.